Despite the constant criticisms and the technical problems that have surfaced at some recent events (most notably during a “hot babe display” that’s on YouTube), Microsoft continues to roll the hype forward with its motion-sensitive Kinect device. One of the games being prepped for it, set to come out on the same day of its release, is Kinect Sports, Rare’s take on the multi-sport game. We recently had a chance to try out one of the activities during a recent Microsoft get-together, just to get an idea how it felt. Now, Kinect Sports in itself contains several activities, including hurdle jumping (complete with Chariots of Fire theme – nice), javelin throwing, beach volleyball, ping pong, boxing, soccer and bowling. Out of all of these, we were only able to try out the bowling game, as the others were not available in the hands-on (or is that hands-off?) demo we were provided. That’s okay, we figured that bowling was simplistic enough, and we’d be able to score strikes and spares with ease. Right? Rare pumps plenty of party atmosphere into its bowling game. Well, while we won’t say that trying out the Kinect was a disaster, there were times when the control set-up was so quirky that the device didn’t read out our motions entirely. One of our cohorts constantly ran into problems with ball-rolling. He’d reach out to his right to grab the ball (which magically flies up into his hand, which is odd to begin with), and before he can even initiate a arm back-swing motion to give the ball momentum, it went flying down the lane, as if he propelled it forward with a shove. The Microsoft rep stated that this was something that would be fixed in the final game. Yeah, let’s hope so. “Push bowling” isn’t as cracked up as it sounds, despite what some aggressive bowlers may think. When we tried it out ourselves, we didn’t run into the “insta-launch” ball problems our friend did. We had more concentrated arm movements, which were precisely read by the Kinect. The ball flew up into our hand (again, weird) and we leaned back to start the swing and then forward again to launch the ball. Now, the device doesn’t properly read when you physically let go of the ball. It does it for you when you reach the bottom of the swing back. That makes sense, but there’s a problem with that. Because it releases automatically at the bottom of your follow-through instead of after, you have to prep your spin beforehand with hand positioning. While that doesn’t sound too difficult, the Kinect didn’t quite read about hand motions at the right level. As a result, most of our balls came with spin movements, even though we didn’t want them, and about eight times out of ten, we missed the head pin almost completely. This can obviously be adjusted to, but Rare should include some kind of manual release, so the player doesn’t let the ball fly out of their hand by mistake and suffer a gutter ball as a result. The rest of the game looks fine. The glittering light effects on the lane reminds us of our fun Cosmic Bowling sessions, and the in-game Avatars resemble good bowling models. The animation on both the players and the pins are realistic, so you don’t have to worry about pin physics getting out of hand. The way the game skips over slow gutter balls is nice, as you can get right to the next frame without having to wait. The bowling’s fun, but hardly something we’d call “accurate”. Best of all, there’s a replay system at the end of the final frame, which shows not your virtual bowler in action, but you, via camera replays. It shows your progress as you made your way through the game, capturing your stance. This is an interesting addition, and one that’s sure to haunt some folks after a few drunken gutter balls. You’ve been warned, folks. 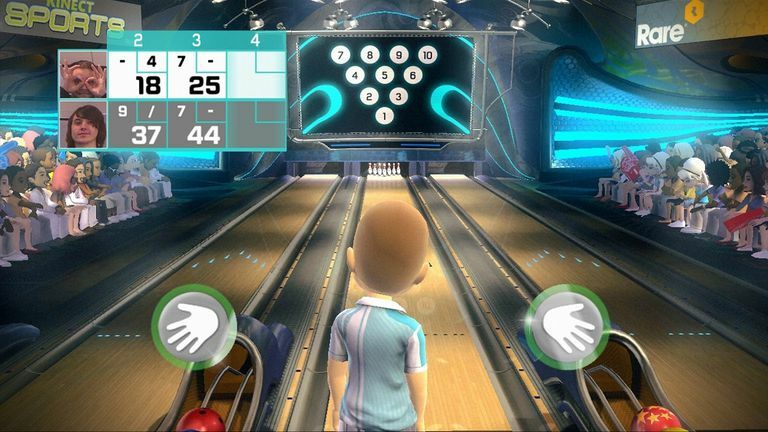 Kinect Sports’ bowling game needs a little more work, and we haven’t tried out the others just yet to pass a judgment. For now, it’s acceptable, but hardly the best bowler in town. We’ll see how the final game shapes up when it hits stores this November. Robert Workman began playing video games in 1979, making him a 30-year veteran (yes, he’s old). He enjoys a variety of old school and new releases, and specializes in downloadable content for WiiWare, PlayStation Network and Xbox Live. He’s worked on several sites, including GameDaily, Examiner.com, RunDLC, Modojo and Segadojo. He’s also a self-labeled “master of beers” and a sports nut.